I am so incredibly impressed by the quiet book I get to share with you today. 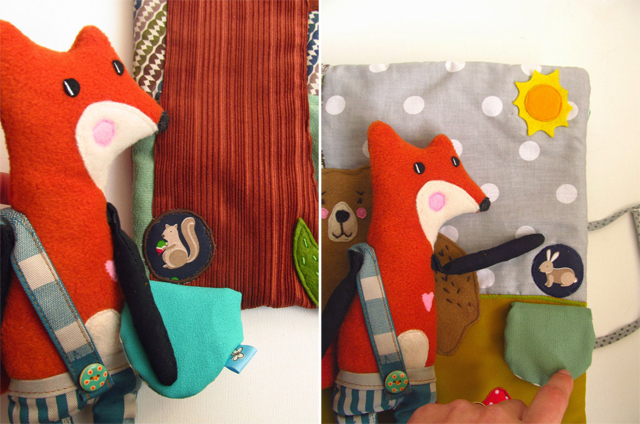 Made by Agata of the blog Agatownik, this book features a little fox who lives in the forest with his friends. As Agata explains, "This is not a typical quiet book. This is a big book where lives a little fox. When designing the book I focused on this to be a fun creative child and his friendship with a fox. The book is to stimulate a child's imagination. Fox has his friends in the forest, which he visits every day. He also has a room has a comfortable bed, a mirror, and clothes." I love all of the fabrics Agata used and all of the detail she put into every page. This truly is a beautiful book and would be an absolute treasure to the child it's given to. Agata created her book for the competition "A Child Friendly Toy," organized by the Museum of Toys and Play in Kielce, Poland (the largest and oldest toy museum in Poland). Her book's name for that contest was "Vulpecula and Friends" and it won third place in the eighth annual competition. Congratulations, Agata! I'm Agata; I am a mother, wife, and I love crafts. The book was designed for the contest "A Child Friendly Toy," organized by the Museum of Toys and Play in Kielce, Poland. My adventure with sewing takes about two years. Work on the book took almost a month. This is the period from design, through the selection of fabrics, with the same concept implementation. Of course it was not continuous work. Only done in my spare time. The book is made according to an original design I made. The book is quite large, all pages are permanently stitched together. The book is made of different materials. Cotton, felt, fleece, corduroy. It is a mix of fabrics, which usually I use. I have no idea how much it could cost. The most I like fox room is very cozy and has a well more balanced colors. To see more pictures of Agata's amazing book, check out the post on her own blog: Agatownik: "Vulpecula and Friends." Agata, thank you so much for sharing your absolutely beautiful book with us! Happy Monday! I hope the start of your week has been good. Today I get to share with you a beautiful quiet book made by Sarah, who made it for her nieces. She used lots of bright, colorful patterned fabrics that add so much life and interest to her quiet book. Her different pages include a chalkboard page, mailbox page (with handwritten letters inside), a color page, a dress up doll page (with a wardrobe full of little clothes), a memory flip page, a button and lace page where you can make shapes, and a counting page. It is an absolutely beautiful book. I can't get over the fantastic color page or all of the beautiful, unique little clothes for the dress up page. I hope you enjoy it as much as I do! What's your name? What's your level of sewing experience? 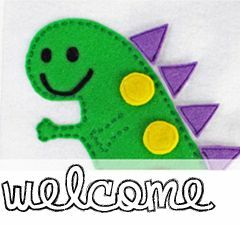 My name is Sarah and I just get such a kick out of sewing pretty things! I started with quilting, but have enjoyed the much faster results that come from quiet book piecing! I learned to sew basic embroidery and piecing from my mom and grandma when I was about six. I have been doing sketches for it for over a year; but they have set in my "unfinished work" basket for months and months. I decided this Christmas would be the one-that-I-got-the-book-done. I have no idea how many hours it took, start to finish, but I would estimate around fifty. Eek. I used a template from Serving Pink Lemonade's blog for the paper doll-girl. I got the idea for the memory flip page from thisishappystuff.com (Busy Book: Memory Flip), but I improvised the execution of it.The other pages were inspired from various education and craft blogs and Pinterest. The book is basically made out of three 12"x 24" mini-quilts. the first one is slightly longer, and serves for both covers. the other two quilts (which contain four pages; two on front and two on back) are sewed down the center directly onto the cover "quilt." Since I have done quite a bit of sewing and have a stash of scrap fabrics, I didn't have to buy anything specifically for this project except for some buttons, and iron-on vinyl (with which I covered the "letters" and "picture memory"). My favorite things about this book are: the letters to my nieces with the photos of the first time I met each of them, and the photo memory game, because those pages make it so personal to the girls. I enjoyed making the felt doll clothes the most, and reminiscing about past sewing projects I had done for my little people as I used scraps for the color/texture page. The book is absolutely full of good memories for me! I am working on one for my little sons now, and using some of their outgrown baby clothes, which makes is extra special to me. Sarah, thank you for sharing your beautiful quiet book with us! Happy Wednesday! I hope your week has been a little bit warmer than ours; we had some freezing rain last night and all the schools in the area canceled school because of the ice! So we're wearing warm clothes and trying to stay cozy inside. 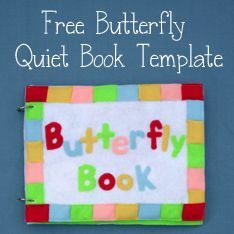 Today I get to share with you a quiet book made by Donna, a stay at home mom who made this book for her friend's son. It is such a cute book and has some unique, really fun pages! The first page is a "Dress Jake" page, for fans of the "Jake and the Neverland Pirates" show. Donna's Jake and his clothes are so cute and so like the cartoon! I love it. She also has a piggy bank page, a camping page, a toolbox page, a dog page, a pizza page, and a car page. One of the details I really like is the pepperoni on the pizza page - each pizza slice has a different number of pepperonis, so kids can use the different slices to count up to four. Very easy, and clever! So without further ado, her is Donna's adorable quiet book! Donna, I'm a stay at home mom and love crafting. My friends little boy. He is two. About 10 hours over about one week. No templates really. Just kind of drew them out from looking at pictures. I did get some ideas from other books I have seen on Pinterest. The camping idea came from Imagine Our Life: Camping Quiet Book Page. The dress up Jake because that is my friends sons favorite character. 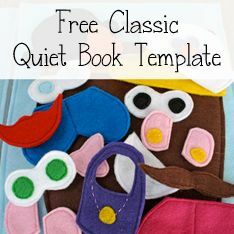 Thank you so much for sharing your super cute quiet book, Donna! Happy New Year! I hope that you all had wonderful holidays and have had a good start to the new year. The Quiet Book Blog is back after its holiday break, and I have some cool new books to show you! 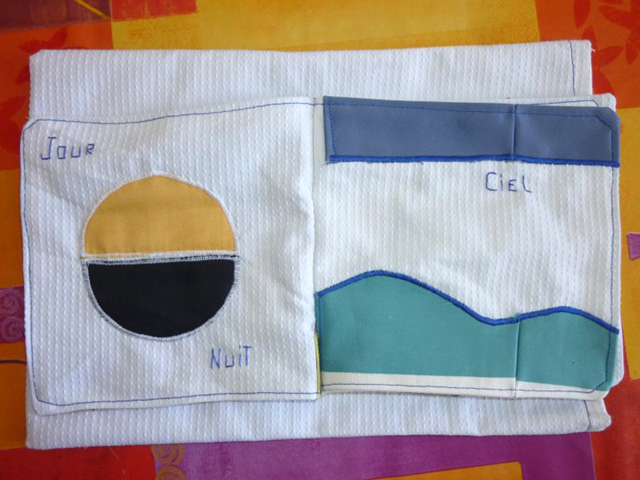 Today's quiet book comes to us from France, made by Sarah of the blog Napirasu for her friend's son. Her book is based on the first chapter of the bible, which describes the creation of the earth. Each page shows another part of creation - first the division of light from darkness, then heaven, and so on. 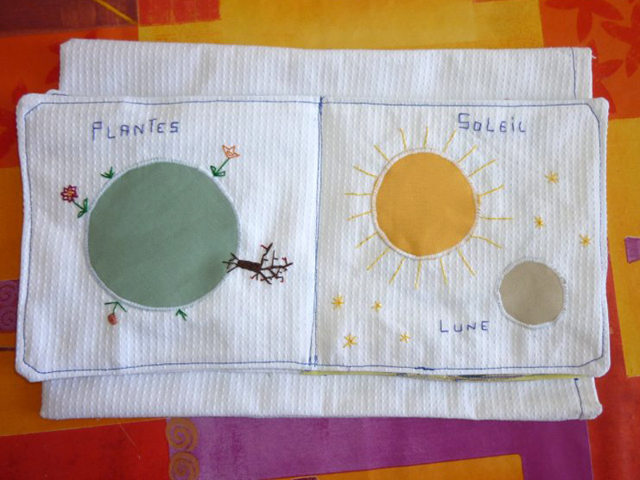 Each picture also has the (French) word describing that step of creation. Sarah was kind enough to provide an English translation of the book, which is below. I think my favorite page is the sun and moon page - I love the twinkly little stars! Please, enjoy! 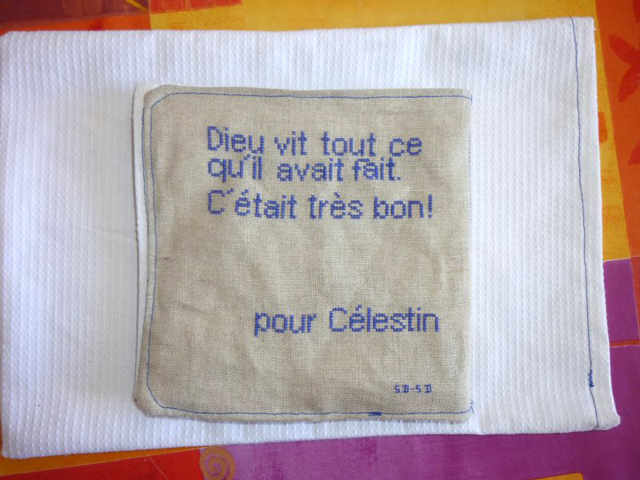 Dieu vit tout ce qu'il avait fait : c'était très bon. : God saw all that he had made, and it was very good. My name is Sarah. 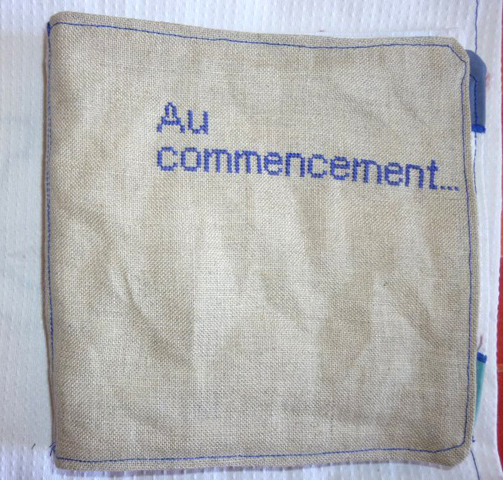 I'm french, I'm 32, I have no kids but I love sewing for my family's and friend's children. 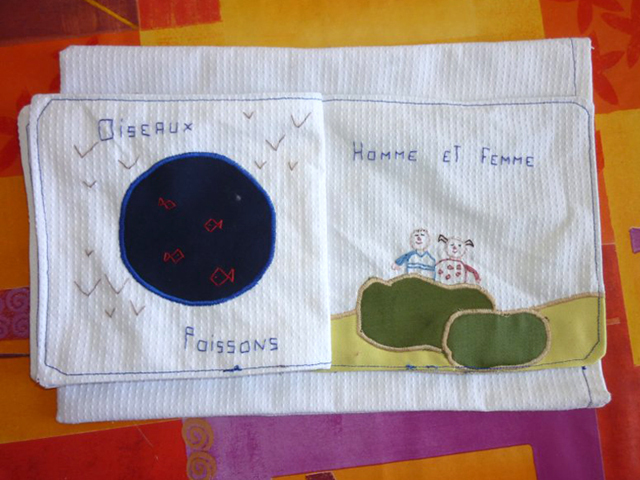 I made this book with a friend of mine (who did the embroidery) as birth gift for baby Celestin, the son of friends of us. I really like sewing, for 7 years now, but I still lack of technique. I can't tell exactly. Maybe a few hours sewing; the shapes are all really simple. I didn't use templates, but found some inspirations in medieval books, where the creation is symbolized with circles. I sewed the pages together. Cotton, and a lot of scraps I had left. I like the one with plants. To view Sarah's quiet book on her own blog, with more description and images of where she got her inspiration, click here: Napirasu: Au commencement. Sarah and her friend also made another quiet book about baptism, which incorporates the elements found in a Catholic baptism (a church, cross, water, oil, white garment, and light). It's lovely (and I love the embroidered cover); if you'd like to see that quiet book, just click here: Napirasu: Quiet Book - Bapteme. Thank you so much, Sarah, for sharing your beautiful quiet books with us!